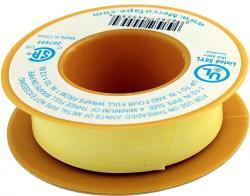 Yellow Teflon Tape (3 - 3.5 mils) 1/2" x 260 in. 100% pure PTFE thread seal tape. A naturally lubricated tape that is clean to use and does not harden. For use in all threaded connections and fittings Seals tight for professional results. Suitable for commercial installations.